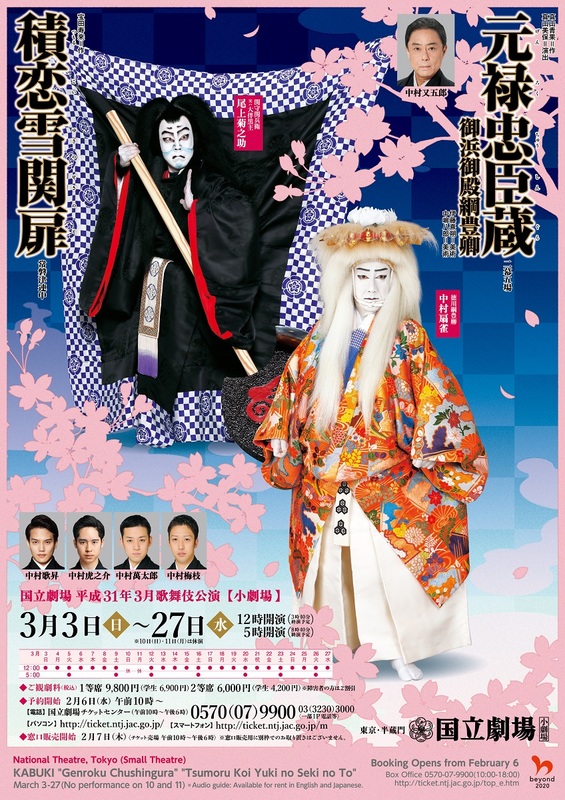 Kabuki performance "Genroku Chushingura" "Tsumoru Koi Yuki no Seki no To"
English Top > Performance Schedule > National Theatre > Kabuki performance "Genroku Chushingura" "Tsumoru Koi Yuki no Seki no To"
*End time is estimate and may vary. Special discount "After 7 KABUKI" tickets are now on sale! There are few plays more popular in kabuki than “Chushingura” or “the Treasury of the Loyal Retainers,” the story of a true incident when a samurai lord, Asano Takuminokami, the lord of Akō Domain, attacked another, Kira Kōzukenosuke, in the shogun’s palace, was immediately sentenced to ritual suicide and his domain confiscated. 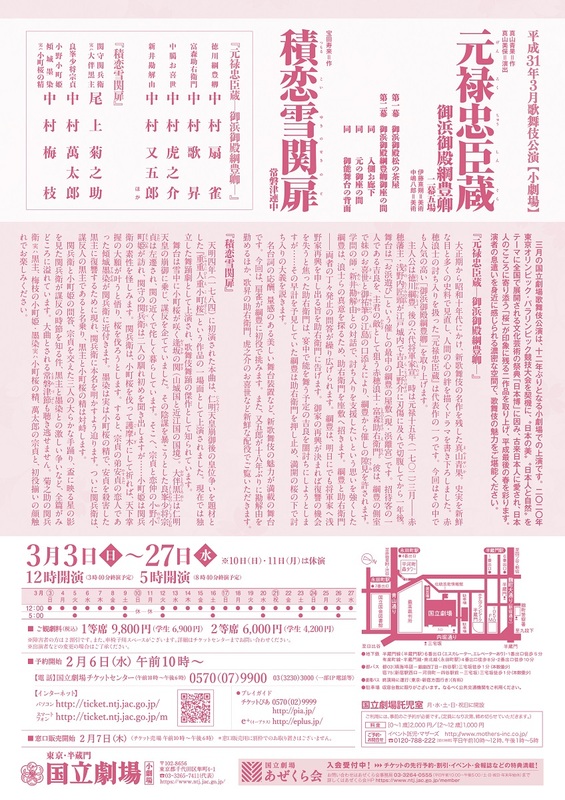 In the modern period, from 1934 to 1941, Mayama Seika (1878 – 1948) painstakingly reworked this play into “Genroku Chushingura,” a vast cycle of plays in ten parts focusing on different incidents and different characters in this revenge classic adding historical details reflecting the Genroku period. This month, a part of them is performed. The story takes place in March 1702, the following year of the sword incident in shogun’s palace. Lord Tokugawa Tsunatoyo (the future sixth shōgun) is holding a beachside party. Feeling sympathy for the masterless samurai of the Akō Domain, Tsunatoyo considers reviving the Asano clan. Learning that Kira Kōzukenosuke will attend the party at Tsunatoyo's place, one of the masterless samurai, Tominomori Suke’emon, wants to observe the party. Tsunatoyo tells Suke’emon that he will ask the shōgun Tsunayoshi to reinstate the Asano clan. Suke’emon is shocked to hear this, for if the Asano clan is reinstated it will be impossible for them to kill Kira. Suke’emon decides to kill Kira on his own. He ambushes Kira on his way to the Nō stage. However, the man he attacks turns out to be Tsunatoyo himself disguised as Kira. Tsunatoyo lectures Suke’emon, emphasizing that the important thing in revenge is its process. One of the greatest dance plays in the kabuki repertory. Yoshimine no Shosho Munesada lives in an abode at the Osaka barrier. The cherry tree beside the abode is called Komachi Zakura since the pink color of its blossom deepened by the virtue of Ono no Komachi’s poem. On a winter night when Komachi Zakura blooms out of season, Komachi comes to see Munesada whom she loves. He doubts the barrier keeper Sekibe’s origin because of the check Sekibe dropped and tells her to go away. Sekibe is in reality, Otomo no Kuronushi who has ambition to rule the world. He learnt that his ambition will be realized if he cuts Komachi Zakura to homa sticks tonight, so he tries to cut it, but he is paralyzed and the courtesan Sumizome appears from behind the tree. She is in reality, the spirit of the cherry tree in human form. She thinks of her husband Yasusada who died an unnatural death and she fights against Kuronushi fiercely to avenge Yasusada’s death.